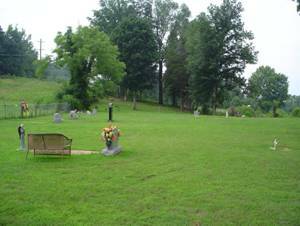 The White/Morrow Cemetery is southeast of Green River in Waynesboro, TN. To reach the cemetery, travel south on Tennessee Highway #13 1.8 miles. Turn east off highway 13 onto Helton Street and go .2 miles. Turn right onto Upper Green River Rd. and travel .6 miles. Turn left at the Green River Tabernacle and travel .1 miles and turn right over a small bridge. Drive along side the field and up a small hill. The cemetery is directly in front inside a fence. This cemetery, according to sources, is actually two cemeteries. The first being the White Cemetery and the second being the Morrow Cemetery. The Morrow Cemetery has no recent burials whereas the White Cemetery has a burial as recent as 2008. In this enumeration, the White Cemetery is listed first & the Morrow Cemetery next. Harden, J.N. ; Co. “A” 10th TN Inf. Irwin, Martha A.; b. 12 Mar 1856, d. 31 Mar 1880, wife of Samuel H.